Today, April 7th, marks the start of National Library Week—because we love libraries so much, and we need an entire week to celebrate them. National Library Week recognizes the incredible free services that public libraries provide, including access to books, job training programs, English as a second language classes, and bilingual story hours. This year’s National Library Week theme is Libraries = Strong Communities, which perfectly illustrates how these beloved institutions foster a sense of belonging. In the spirit of community, we asked our community to share their fondest library memories from childhood, adolescence, and adulthood. Their heartfelt, nostalgic replies will make you proud to be a bibliophile. “My elementary school librarian and her husband built a loft in the school library. Each week, the librarian would select a few of us for the privilege of having our reading time in the ‘treehouse.’ Climbing up a few steps to sit on a carpeted platform somehow made reading my horse books that much sweeter. I don’t know if I was ever happier.” –Carrie K.
“As someone who grew up without a lot of money and in a pretty tumultuous household, the library was a place where I could go and be anything I wanted, learn about anything I wanted, and find a sense of freedom that didn’t always exist for me in the outside world. Now, as a parent, passing on my favorite books and my love of wandering through the shelves feels like letting my own kids in on the very best kind of magic.” –Ashley A. “In third grade, our teacher, Mr. Koeller, would take us all over to the big public library and let the whole class check books out on his card. We’d come back to class, spread pillows and beanbags out, and spend the whole afternoon reading. He made sure we met all the librarians and knew how to find things. That’s really where my love of the library began. I was a voracious reader, so a whole building full of ‘free’ books was the best thing ever. I checked out a book called The Circle of Time over and over from our school library. I know it wouldn’t be there 30 years later, but part of me is sure if I walked into the library, went to the first set of shelves on the left, and then the second shelf down, at the end closest to the door, it would be there waiting for me.” –Cathy L.
“The library was a haven for a child’s curiosities, and a place where I felt like I could readily challenge myself, for instance, by attempting to read Lord of the Flies when I was only in the fourth grade. In my elementary school, our librarian treated all the books like they were her baby and would sit us down and tell us never to open a book too wide. She was the sweetest lady and a polar bear lover, so all the computers in our library had polar bear screensavers that I can picture all too well.” –Sandra L.
“I love my library! So much so that I want to get an old card catalogue, but to reference all the quotes I copy from books. When I was a kid, I set up a library in my room and checked out books to my family. So library-ing has a long history in my life.” –Sarah B. “I fondly remember going to my local Denver library as a kid, maybe 10 or 11 years old. Each week during summer, I would always get a stack of books and then proceed to devour one every morning as soon as I got up. Now, with my own kids, it’s so fun to let them pick out books to read with me. I love the library. And there’s one across from us so we go all the time. My younger son got his first card when he was two months old.” –Linnea C.
“I have so many memories about the library, but the most important one for me is that one librarian named Fran (so perfect) used to pick out the brand new picture books that came in and show them to me, because I really loved the feeling and the smell of brand new, never-been-cracked books. Whenever I would go in there, she’d give me the new books and I’d smell them and rub my hands on the pages. I’d also read them, of course, but she let me have this weird little kid fetish, and it was really a way of going the extra mile.” –Angelica F.
“I used to ride my bike to the library ever summer, usually with a backpack, so I could check out as many books and movies as they’d let me. I’d read them all in three days and return for another load. I ended up working there for a summer after grad school, and I fell in love with the history of the library. We’d originally been granted the money for a Carnegie library, like most small towns back in the late 1800s/early 1900s, but one of the town’s businessmen decided that he wanted to fund something better—and he paid to build this GORGEOUS library. Unfortunately, about two or three years ago, some kid shoved a lit firework in the library return box and the building caught fire. Most of the interior was damaged, along with a lot of the books and equipment, but the town rallied around it and they’ve been rebuilding ever since. They even reopened a small location in a little shopping center to keep serving the community, which I just think is the coolest thing.” –Jandra S.
“After I graduated from college and moved to my first apartment, I asked my mom to send me a letter so I would have proof of my address to go get a library card. It’s one of the first things I do when I move because it makes me feel like part of the community. From there on out, whenever I move to a new place, a card from my mom would arrive within a day or two saying, ‘I love you, enjoy your new library.’” –Sarah F.
“I used to go to the local library all the time with my sister and my cousins. We would check out Baby-Sitters Club books and once a librarian told me it was like eating cake for every meal. I was like, ‘I am 7, pick your battles?’ We would discover our other favorite series and hide them in the library so we could find them again. One of the first things I did when moving from Chicago to L.A. was get a library card. It made me feel at home.” –Kristin C.
“I live near the town where I grew up, and whenever I go to that town’s library, I slip into the children’s section, drop down to the floor, and search for the books by Natalie Savage Carlson. When I find one, I pull it from the shelf and flip open the front cover. There it is, in my 7-year-old cursive: my library card number, a number that 30 years later I still recall by heart. Although they’ve long since moved over to bar codes, [as long as] the library still has some of the original sign-out cards in its older books, they still have a piece of my childhood.” –Jeanne S.
“A very large percentage of Sunday morning in college, I’d get up early-ish, get a Sunday New York Times, and read it in the really beautiful historic reading room in the biggest, fanciest library on campus. I really loved doing non-studying related reading in the library. I wish I had that sort of ritual now.” –Jess R.
“I remember the library viscerally: the concrete steps leading to the big glass doors, the modern slant of the roof, the flat gray carpeting, the wooden drawers of the card catalog, the typewriter font used to label the books with the Dewey decimal system, the scents, and the strictly observed silence. What I loved most about the library was the scent of books, especially at the ends of the stacks near the windows, where the sunlight warmed their spines and made me want to hold them. My little brothers ran to the bins of paperback books with 45 rpm records in plastic bags—Curious George, Casper the Friendly Ghost, Clifford the Big Red Dog—and then to the cubbies where you could put the record on and listen with gigantic, puffy earphones as you turned the pages at the sound of the beep. My parents checked out books, magazines, and even artwork, which they’d hang on the dining room wall.” –Anne N.
“Our local libraries were always like sanctuaries to many of us growing up. We didn’t have many options of places to go after school, so having a quiet place to read, do research, and hide out for a bit was a welcome change. And the librarians were constantly friendly and willing to make great reading suggestions. When I became a mother, the library offered story time for tots. Little ones were able to enjoy a story and a snack while parents got the chance to relax for a bit. Unfortunately, a few years ago, almost all of the county’s libraries were shut down due to budget cuts. It was devastating to so many in the community. Thankfully, some hard-working individual citizens refused to accept the closures and worked diligently to get the libraries reopened. Our biggest library was just reopened a few months ago!” –Alicia G.
“I love libraries because I love how they provide safe access to technology for those who are vulnerable; women who need a safe place who are victims of domestic violence, anyone else experiencing tech abuse, and the low-income/homeless.” –Kelly C.
“Libraries have always been where I felt most at home; I spent hours and hours when I was younger walking up and down the rows of books with my head sideways, reading all the titles and looking for a new read. My family (we were homeschooled) would go to the library about once a week and leave with 50+ books; sometimes we’d have so many that we couldn’t put them all on our card. These days I still go to the library once a week, but my books are longer now so there are less of them! There is one librarian at my nearest branch who would nerd out about Flannery O’Connor with me in high school when I was writing literary synthesis papers on her work. I’ve been to libraries in many different states and even have some books from a library in West Virginia that a kind librarian let me take.” –Hailey H.
“I always loved to read growing up but truly found solace in libraries when I was a freshman in college. I had a tough time adjusting and making friends, and the library was a sanctuary for me—I could go and get my work done and get lost in books for hours and hours…it truly became my comfort zone. Now that I’m an adult, I visit my local library once a week to take out books, and even though those lonely college days are behind me, I’ll always have a soft spot in my heart for the library as a safe haven.” –Arielle T.
“I cannot stress enough how magical libraries have always been to me. From a young age, I felt overwhelmed with joy when I stepped foot into a library—free! Books! So many books I can’t imagine being able to read them all. I love that feeling. I still feel that way to this day. I have always been a big lover of libraries and books and still heavily utilize my local branch(es). But last year, I started volunteering at my library once a week to help kids with their homework, and it has made me love them even more. Helping the kids, getting to know these awesome humans, all the while surrounded by books? Kinda a dream.” –Jess T.
“In Port Washington, the library was one block from our house. I loved going there in grade school. It was a great escape! I remember reading The Phantom Tollbooth, A Wrinkle in Time, Harriet the Spy. There were these huge, deep armchairs I could just sink into. I remember bringing stacks of books and putting them on the chair with me. I’d study the covers and read the text on the back. Then I’d read a few pages to see if I liked any of the books. Sometimes I’d have to get a new pile of books. I’d lose myself and forget time. Then either I noticed it was getting dark outside or my stomach started growling. I’d check out my book and head home for dinner.” –Dorri O. “My mother was a librarian, I was a librarian for six years, and we ALWAYS visited the public library in whatever city, town, country, or beach we go to. My mother was a pusher—a book pusher. She’d check out library books, and then put them in her neighbor’s mailboxes, calling them and saying they ‘must’ read it.” –Meredith K.
“Getting my first library card was a bigger deal than getting to cross the street on my own. I loved ‘my’ librarian who always found a new book about horses for me to read. Also, when the old library was closed, our town (Hingham, MA) called for a bucket brigade and people lined the sidewalk from the old library to the new one and passed books from one pair of hands to the next until the shelves in the new library held all the books from the old one.” –Liz D.
“I adored the tiny library in my Chicago suburb as a kid and checked out all of the Nancy Drew and Hardy Boys books! I spent this afternoon at the central library in downtown Los Angeles. It is so much more than books but full of stories, like a museum and library and history lesson rolled into one. Gorgeous 1920s Art Deco architecture that was restored back in the ‘80s and ‘90s. There are spectacular murals and a lot of public art. What really spoke to me today was an exhibit called 21 Collections: Every Object Has a Story. It was a curated exhibit of random collections, like Tom Hanks’ vintage typewriters, hundreds of matchbook covers from gay bars, paper samples from lined envelopes. It was really eclectic! I love how in L.A., this central library has morphed into something so much more. They’ve kept up with technology and library trends while preserving the building’s long and rich history.” –Mary N.
“I love that my local library provides free meals for children all summer long!” –Christina V.
“I grew up in a town with a lovely little library. It had a small main lobby where the librarian sat, then a large-ish room on the left for the grown-up books and a same-sized room on the right for the kid’s books. That alone was notable. I loved going there because it was where I got my first taste of public semi-freedom; my mom would send me into the kid’s room while she went to check out what new novels came in that month. I specifically remember reading two books in particular almost every time I visited: Caps for Sale and Dandelion. When I had my first baby, I was absolutely thrilled to see they are both still in proint. My children now love them too. We probably never would have discovered them without that little library.” –Caroline G.
“My mother was in graduate school while I was growing up, and I loved hanging out in the university library while she studied. I would randomly choose a floor, take the elevator, and then randomly choose from one of the colored tape paths that led from the elevator into the stacks. The tape paths were intended to help students find the call numbers they were looking for, but I wasn’t familiar with Library of Congress cataloguing so I had no idea what I might find at the end of the tape trail. And that was the fun of it—finding whatever random interesting field of interest lay there, deep in the stacks, and only being able to find my way back by following the same trail. I just adored this game and played it every chance I got.” –Lori S.
“I have great memories of my local library as a kid, but more recently I RV traveled around the country with my husband and kids, and visiting local libraries was a key part of that experience. When I think back on the 18 months my family spent traveling around the U.S. in an RV, the public libraries we visited stand out in my mind right alongside the National Parks. As we relocated every few days or weeks, local libraries were a treasured space where I could write on my laptop in peace while the kids gorged on books that we couldn’t keep in our limited space. Libraries were an insight into and connection to towns we were only passing through. 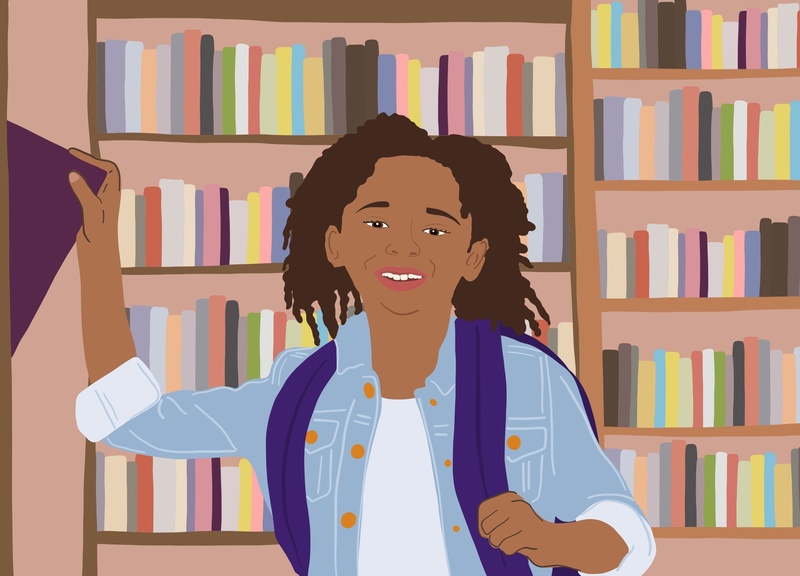 And now, when I see my kids sit on the floor with a pile of books in my small hometown library—where I spent many hours as a child, and where my mother/their grandmother now works—I feel a connection with the libraries across the country, from modest to grand, that are invaluable public space for all of us.” –Michelle N.